Even people in Bangladesh didn’t know that George Harrison had organized a fundraiser on their behalf. They were too busy trying to survive the aftermath of 1970’s Cyclone Bhola, which had killed anywhere from 300,000 to 500,000 people, as well as wartime atrocities committed by Pakistan, whose military regime was determined not to let the country’s repressed eastern part secede to form a new nation. In November 1971, Beatnik poet Allen Ginsburg visited squalid, overcrowded camps in India housing millions of Bangladeshi war refugees. The resulting poem, “September on Jessore Road” was a damning critique of official U.S. indifference to their suffering. 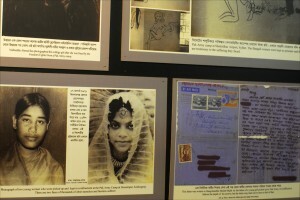 Black-and-white photographs of some of the estimated 200,000 Bangladeshi girls and women raped by Pakistani soldiers during the 1971 war of independence are displayed at the Liberation War Museum in Dhaka. Shankar, now 92 and still touring, said the concert — which ended with the very song he inspired — exceeded everyone’s wildest expectations. Mohamed Mijarul Quayes, the country’s foreign secretary, was an 11-year-old boy living in Islamabad, Pakistan’s capital, when the famous Beatle and his friends made music together that August evening in New York. Dulal Chandra Biswas is director-general of the Press Institute of Bangladesh. Only seven years old at the time, he says even small children today are taught in schools about the concert and its implications. In the past 12 months, interest in the concert has been revived thanks to Martin Scorcese’s 2011 documentary, “George Harrison: Living in the Material World.” Coincidentally, on Oct. 25, Rhino released a DVD of the concert, the same day Capitol issued a remixed, remastered CD of the project. All artists’ royalties from the sales of the DVD will go to the George Harrison Fund for UNICEF — which is raising money to fight malnutrition in Africa. One more piece of good news for Harrison fans: Bangladesh’s Liberation War Museum will soon move from its cramped quarters to a spacious new home, following a $9 million fundraising effort. The new ultramodern facility, located in the Dhaka district of Agargaon, is expected to be inaugurated in late 2014. And another Beatles’ story here.